Precision components for safe leak free fluid dispensing from cartridges. Industrial grade safe and silicone-free products to apply adhesives, pastes and assembly fluids. Use with air-powered dispensers, cartridge guns or retainers. Cartridges handle thin liquids to thick pastes safely at air pressures up to 100 psi. 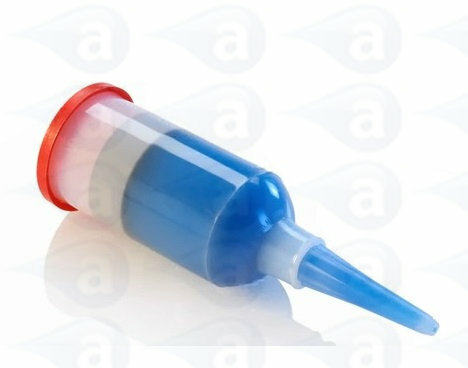 Plungers are for use with dispensing cartridges. The plunger is inserted into the cartridge once filled and moves consistently down the inner walls to ensure all material is dispensed without waste. Plungers can be used at pressures up to 100psi, for example when used with a pneumatic cartridge gun system. Select plunger size to suit the cartridge size you use. The Techkit cartridge is a unique system allowing the handling, mixing and dispensing of 2 or 3 component materials such as epoxies and silicones. Materials can be filled into the main cartridge body and kept separate up to the point of mixing. In sizes 2.5oz, 6oz, 8oz, 10oz and 20oz with either barrier style of injector style. Delivery: Products shipped by courier on a tracked and insured service for stock items. Products on a longer lead time or built to order will be sent as soon as available. Customers are informed of ship dates. Most items listed on this page are held in stock.